Lately I’m loving all things comfy casual. Maybe its the New Jersey humidity, but it has me craving swing dresses and tan sandals. Pretty much anything that breathes, but still looks cute. I’ve been on the hunt for the perfect knee length swing dress, and finally found one! The best part is that its on sale for only $25 and comes in four other colors! SCORE!!! Make sure to size up for length, I am normally an XS/S and bought a large. Its a looser fit but still looks great! Happy Shopping! I need this swing dress immediately! 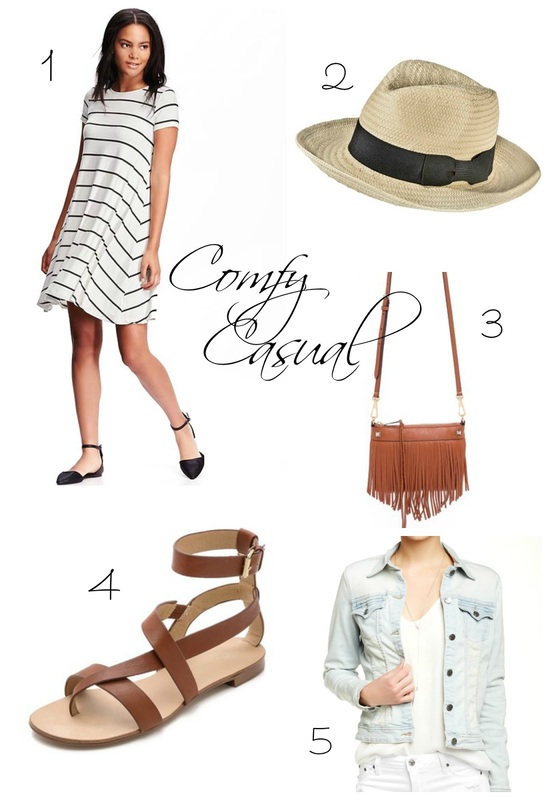 Love the stripes and you could style it so many different ways! I love love that dress! So comfy! These are definitely great picks for a casual comfy look. That dress is just so easy on the eyes. Isn't it? Im obsessed with mine. <3 <3 Thanks for stopping by! I love the dress, i have something similar but it's way too short! Happy Wednesday, lovely! Great picks, love them all! I'd love to see you IN the dress. I worry it might be too short for me.